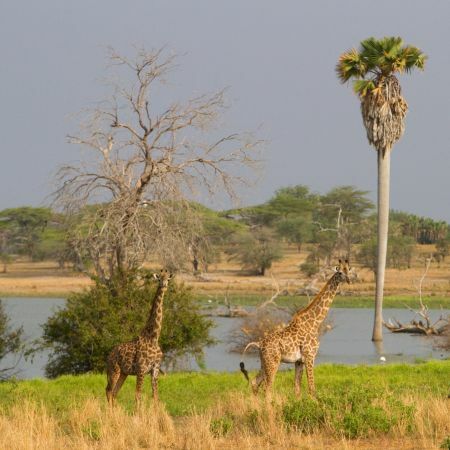 The Selous Game Reserve is one of Africa's largest game reserves. Covering approximately 50,000 km², it accounts for about 5% of Tanzania's land mass, but to put it more into perspective, it is 4 times the size of the Serengeti, and twice the size of the Kruger National Park in South Africa. And about 50% larger than Switzerland or Belgium! The reserve is a mixture of canopy forests, grass plains, swamps, wetlands and woodlands, and a series of 5 interconnected lakes filled by the great Rufiji River, which meanders through the reserve. Stiegler's Gorge, where the Rufiji and the Great Ruaha River meet, is a stunning natural feature, as it is 100m deep and 100m wide. There are also hot springs. Large herds of buffalo, rhino, wildebeest, zebra, giraffe and impala roam the open plains. Hippos swim in the waterways of the Rufiji, and huge crocodiles lounge on the river banks. Elephants visit the swampy islands, and colobus monkeys swing through the forest trees. The reserve is also home to approximately 1,300 wild dog (the largest concentration in Africa and about one third of the entire world's population), who compete for food with other predators such as lion, cheetah, leopard and spotted hyena. For birders, over 350 different bird species have been recorded in Selous. Unsurprisingly, the reserve is a World Heritage Site. But very surprisingly, it is extremely quiet in terms of visitor numbers. This is mainly due to the fact that only the northern section of the reserve is accessible to tourists, as the rest of the reserve is given over to scientific research and private hunting concessions. 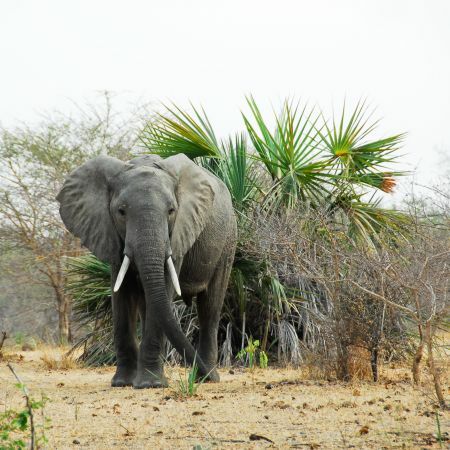 For those who do come here on safari, this is one of the few National Parks where game viewing can be enjoyed by 4x4 vehicle, on foot or by boat down the Rufiji or on the reserve's lakes. The majority of visitors will fly into the reserve, as the roads are pretty impassable, so driving is definately not recommended. The private safari lodges and camps all offer a fully inclusive safari experience, including morning and afternoon game activities. The minimum number of nights recommended is 3, which enables you to fully get the most out of your time here. Many lodges can also arrange "fly-camping" nights in the bush. These is an additional activity which is ideally suited to those who want to experience something completely different and exciting, and who want to get really close to nature and the bush. "Fly-camping" is basically where you go out, and spend the night in a simple, comfortable tent in the middle of the bush, away from all distractions, and with just the noises of the bush to lull you off to sleep. You are accompanied by a ranger and his assistant, and a chef too, who will provide you with delicious meals despite the 'basic' conditions he is cooking under! June to November is the dry season, and is possibly the best time for game viewing along the river banks, as the wildlife is incredibly reliant on the waterways for their survival. January to April is the rainy season, and whilst this makes the bush lovely and lush, and a perfect backdrop for any photographs, it can be very hot and humid during the day, especially in January and February. Many lodges close between March and May. Overlooking the Rufiji River, Selous Riverside Safari Camp consists of 10 spacious tents, all carefully placed to provide privacy and blend into the nature's surrounding and overlooking the Rufiji River and its hippos and crocodiles. All tents are en-suite and are equipped with comfortable beds, electricity and their own private verandahs. Mivumo River Lodge offers just 12 timbered chalets each with a private viewing deck and plunge pool. The brushwood thatched roof is high vaulted to allow maximum play of light and breeze. Children aged 7 years and older are welcome. All the spacious safari tents are widely spaced along the lake shore ensuring maximum privacy and wonderful views. Each tent is en-suite, and sits atop its own raised timber platform with 2 large verandahs on either side where one can sit with a cup of tea in the morning watching the bush come to life at sunrise, or nursing a gin and tonic as the bush gets ready for the night at sunset. The 12 spacious tented suites have palm thatched roofs, and there is an expansive distance between each suite ensuring privacy. If guests wish to be closer to nature, all tents can be fully opened to the sounds, breeze and full view of the environment. Beho Beho has 8 individual very spacious bandas, (stone built and palm thatched cottages) furnished with kingsize beds, Zanzibari day beds, writing desks and comfortable 'suite' furniture. There is also a separate dressing room leading into an en-suite bathroom with twin basins and an 'open air' shower. Accommodation at Sand Rivers Selous is in spacious open-fronted cottages made of stone and thatch, and raised up on the banks of the Rufiji with amazing views out across the river. There are 5 Riverside Rooms, and 3 Hillside Suites.